The Barbican Estate is in the heart of the City of London and is a residential estate, arts centre and museum. It lies on a 14 hectare site which was devastated by bombing in the second world war. The development was conceived in the 1960s, started in 1971 and was completed in 1982. It is Grade II listed and comprises residential accommodation including 13 terrace blocks with a height of up to 7 stories and three 42 story towers grouped around a lake and green squares. The whole is interconnected and connected to the Museum of London and the Barbican Arts Centre by multi level concourses. There is no vehicular access within the estate. The style of the estate’s architecture is brutalist, but despite the concrete facade the multi level concourses (which are open to the public) are an island of calm after the bustle of the City’s pavements and relaxing to stroll along. There are hidden gems, such as the enormous conservatory built into the fabric of the structure. This is home to finches quail, tropical fish and more than 2,000 species of tropical plant. It is open to the public on most Sundays between 11:00am and 5:30pm. To the rear of the arts centre is another oasis in the City – a long lake with waterfalls, terraces and a cafe. On the other side of this water and contrasting with the modern architecture is the medeival church of St Giles’ Cripplegate which has some beautiful stained glass and was Shakespeare’s local church. 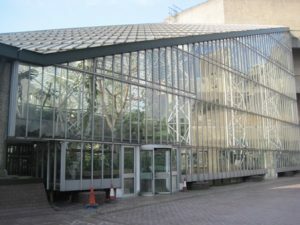 The Barbican Arts Centre is the largest performing arts centre in Europe and hosts classical and contemporary music concerts (it is home to the London Symphony Orchestra and the BBC Symphony Orchestra), theatre, experimental dance, film screenings and art exhibitions. It contains a large library and 3 restaurants.